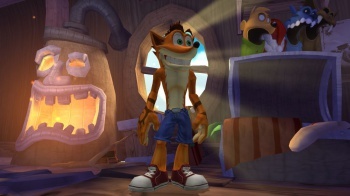 Earlier in the week, the removal of the Crash Bandicoot website and a blurry screenshot prompted Sony fans into thinking that maybe the classic Sony "mascot" was making his way from the archives of Activision into Sony's loving embrace. Unfortunately, this seems to not be the case, as a represntative from Activision has told Game Informer that the company has not sold Crash Bandicoot, and is currently exploring ways to bring back the series. "Activision owns Crash Bandicoot and we continue to explore ways in which we could bring the beloved series back to life." Adam Boyes, VP of Publisher & Developer Relations at SCEA, also confirmed that Activision are still the owners of Crash. When asked by a fan if we may see a Crash Bandicoot game on PS4, Boyes said via Twitter: "Activision owns the IP, so you should ask them about it..."
The Activision Support Twitter, when asked why the Crash Bandicoot website was pulled, replied "Unfortunately, we have no info at this time. If you are interested in another title, we can forward your suggestion for review." So there you have it folks, it looks like Crash is still in Activision's hands, but if we cross our fingers they may bring him to the PS4.